Facade Installation - H.H. TechnoFab- Steel Fabrication | Pre Engineered building company in Pakistan. 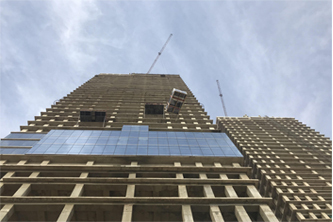 With many projects under our belt in the Middle East, H H Technofab is now a market specialist in façade installation, be it Curtain Wall, Spider clamp Glass installation or any other Composite panel installation on towers or steel structures where working at large height is involved.